Dec. 18, 2007: A powerful jet from a supermassive black hole is blasting a nearby galaxy, according to new data from NASA observatories. This never-before witnessed galactic violence may have a profound effect on planets in the jet's path and trigger a burst of star birth in its destructive wake. This real-life scene, worthy of the most outlandish science fiction, is playing out in a faraway binary galaxy system known as 3C321. Two galaxies are in orbit around one another. 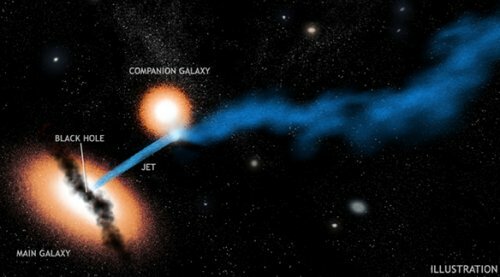 A supermassive black hole at the core of the system's larger galaxy is spewing a jet in the direction of its smaller companion. "We've seen many jets produced by black holes, but this is the first time we've seen one punch into another galaxy," says Dan Evans, a scientist at the Harvard-Smithsonian Center for Astrophysics and leader of the study. "This jet could be causing all sorts of problems for the smaller galaxy it is pummeling." 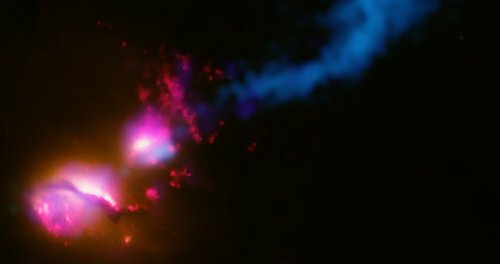 Jets from super massive black holes produce large amounts of radiation, especially high-energy X-rays and gamma-rays, which can be lethal in large quantities. The combined effects of this radiation and particles traveling at almost the speed of light could severely damage the atmospheres of planets lying in the path of the jet. For example, protective layers of ozone in the upper atmosphere of planets could be destroyed. The jet and galactic assault were discovered through the combined efforts of both space and ground-based telescopes. NASA's Chandra X-ray Observatory, Hubble Space Telescope, and Spitzer Space Telescope were part of the effort. Two sophisticated radio telescopes--the Very Large Array (VLA) in Socorro, New Mexico, and the Multi-Element Radio Linked Interferometer Network (MERLIN) in the United Kingdom--were also needed for the finding. A unique aspect of the discovery in 3C321 is how relatively short-lived this event is on a cosmic time scale. Features seen in the VLA and Chandra images indicate that the jet began impacting the galaxy about one million years ago, a small fraction of the system's lifetime. It's possible that the event is not all bad news for the beleaguered galaxy. The massive influx of energy and radiation from the jet could spark the formation of large numbers of stars and planets after its initial wake of destruction is complete. In the distant future, say researchers, whole new star systems may have the lethal jet to thank for their very existance. The results from Evans and his colleagues will appear in the Astrophysical Journal. NASA's Marshall Space Flight Center, Huntsville, Ala., manages the Chandra program for the agency's Science Mission Directorate. The Smithsonian Astrophysical Observatory controls science and flight operations from the Chandra X-ray Center in Cambridge, Mass.